The new Samsung Galaxy Tab 7.7. Photo from Engadget. Assuming I had the money to spare, am I ready to move from my 7-inch Samsung Galaxy Tab to something bigger and newer; something that is faster and that is running Android Honeycomb rather than Gingerbread? This post is all about the potential of ME looking for a tablet upgrade. If you are here wondering about getting a laptop vs. a netbook vs. an Ipad or some other tablet then you may want to read the quick guide I've written here -- "Laptop, Netbook or iPad/Tablet?" Before I acquired the 7-inch Samsung Galaxy Tab last February, I posted "My Next Mobile Device -- God Willing :-)" in order to help me make a rational decision. Now, 8 months later, my Galaxy Tab is "aging" and it might be time to look ahead and do some web shopping. Not that I am not happy with my 7-inch Tab. It still is working wonders and I have been maximizing it everyday -- it's always in my hand or pocket everywhere I go around work and around the house, using for the most part apps like Calendar, phone SMS and calls, YouVersion Bible, Springpad, Amazon Kindle, Camera, Dolphin mini-web browser, Email and lots of other tools and references such as Wifi Analyzer, Guitar Tuner, and several exercise and sports apps. It's time to consider an upgrade (though the wife definitely does not agree with me right now). iPad 2 is beautiful but still out of the question with it's big screen that does not fit my main uses. I admit that the larger iPad and the other 10-inch Android screens are very tempting but as I go back to my needs I still have to cross out the iPad and the other Android Honeycomb 10 inch tablets in the market. A few months ago Samsung released it's own 10.1-inch tablet but for reasons I have already expressed I have to say no to this beautiful iPad competitor (competition in size only, not in terms of sales). 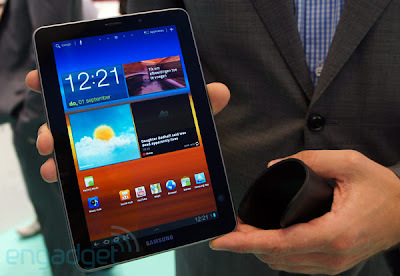 Then Samsung released a smaller 8.9-inch version which is smaller and is also running Honeycomb. 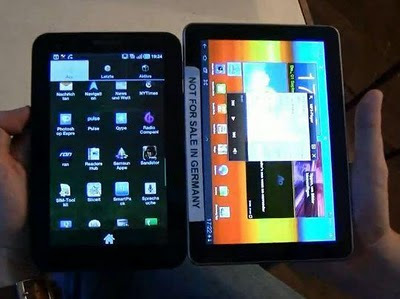 This could well be a candidate replacement for the 7" Original galaxy Tab. 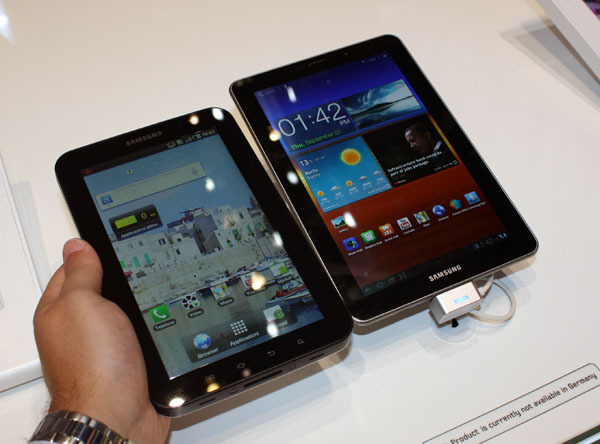 It's smaller than all the 10 inch tablets but bigger than the original Samsung tablet. I admit that there are few instances when I wished my 7 inch Samsung Galaxy Tab were a little bigger -- especially when scrolling through a vertically formatted website when the screen feels too narrow without pinch-zooming the screen and when looking at the calendar. Thus, the 8.9 inch Galaxy Tab seemed the next device to pray and save up for. Then Samsung comes along this September with the 7.7 inch upgrade to the original 7-inch Galaxy Tab. The "0.7" increase doesn't seem much but initial video reviews seem to confirm to me that this indeed IS the ONE! It could well be new tablet that will continue to suit the mobile needs of someone like me. 3. Still Faster on-screen input (thumb board) input than the iPad and even the 8.9" Galaxy Tab. So for the kind of user that I am and for the kind of needs that I have, this has got to be the next device and this has got to be the most beautiful tablet of the year, assuming it gets released. Apple's initial legal battles with Samsung in countries like Germany and Australia, and possibly the USA, will delay the release of this dream machine. For the sake of the millions of non-iPad fans in the world, I hope Samsung wins the patent wars so that this 7.7 baby could see the light of day and into the hands of road warriors, mobile productivity buffs and even students, educators and anyone who can afford a combination phone and tablet computer.